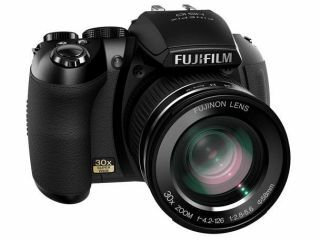 Fujifilm has unveiled its new summer range of cameras, with the HS10 top of quite an impressive crop. The HS10 boasts a 30x optical zoom and a manual zoom mechanism. Both these combined make a world's first according to the camera company. Couple its zoom capabilities with a 10MP CMOS sensor, Full HD recording and motion tracking autofocus and what you have is a feature-packed device ready to take on the photography masses. Also announced are the F80EXR and Z70 cameras. The F80 comes with 10x optical zoom (not bad for a compact), a 12MP CCD sensor and HD movie shooting. The Z70 is pitched at the social-networking crowd, with a one-touch YouTube/Facebook upload function. The Z70 also comes with a 12MP CCD and has a 5x optical zoom lens. For those who don't mind taking expensive bits of kit with them when seeking thrills, the Fujifilm XP10 is, according to Fuji, is shockproof, waterproof (to 3 metres), freezeproof (to -10 degrees) and dustproof. It comes with 5x optical zoom, HD movie recording and a 12MP sensor. Following the shockproof XP series is a hard task but the Fujifilm S-series update (S1600/1800/2500) tries its best with some great zooming options (15x and 18x), CCD sensors and the ability to capture HD video. The last cameras released that are of not are the J-series. The JV and JX series have been given a 5x (JX200/250) and 3x (JV100/150) optical zoom respectively, HD shooting and a rather thin chassis, at just 18.9mm. The JZ300/JZ500 may be a bit thicker (at 23mm) but on-board is a handy 10x optical zoom lens, an HD filming option and advanced CCD-shift image stabilisation. All UK pricing and release dates are still to be confirmed. Go to www.fujifilm.co.uk for more details.